On July 19th 2016, the Lomami National Park took its place as Congo’s 8th national park, the first in more than forty years. The Parc National de la Lomami (PNL) markers are set along the southern limit with local chiefs. This gold nugget surfaced from the travail of many, long collaborations. The real debate started in the villages – under leaf roofs, in empty schoolrooms, or open-air churches. Discussion about park in a Ngengele village along the southern border. High chiefs discussed with village chiefs and hunters coming from afar argued with hunters who lived nearby. The chief of the Langa Sector explains the need to protect animals from overhunting to BaLanga in the village of Yalombe. There were traditional ceremonies; the ancestors were consulted. 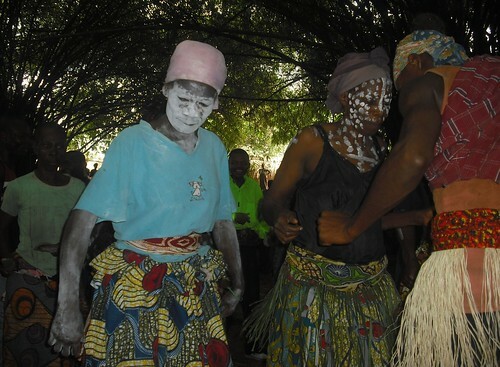 The Mbole and Mituku sing and dance as part of the tambiko ceremony consulting ancestors about the park. There were 5 tambikos called by traditional leaders in the immediate vicinity of the park. The Congolese Nature Institute (ICCN) said a park was needed. In 2010 the villages of the southern sector of the park accepted the park; in 2011 the villages in the north accepted the park. 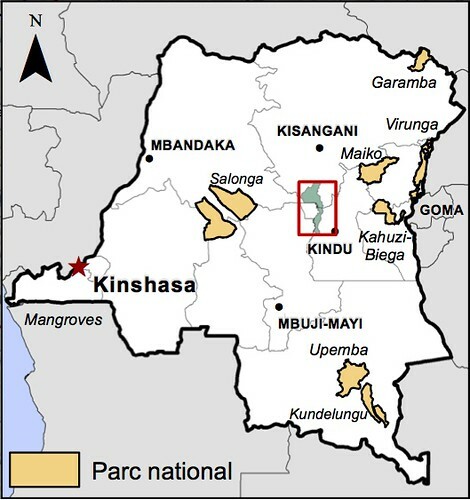 The Lomami National Park (in green) takes its place in the center of DR Congo among its seven other national parks. The park itself is 8,874 km² of uninhabited forest with islands of savanna in the south, hills in the west, and the great natural highway of the Lomami River wandering up towards a northern junction with the Congo River. Our dugouts on the Lomami River close to the border between Maniema and Tshopo provinces. 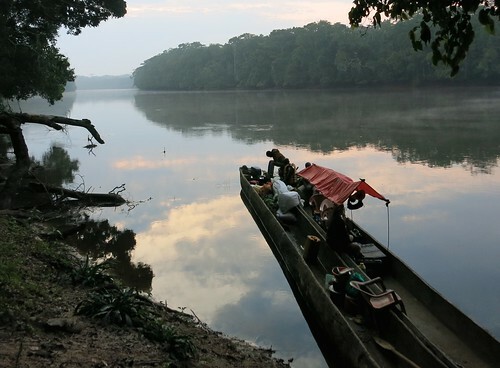 By 2013 the area was locally delimited and the governors of both provinces, Maniema and Orientale (now Tshopo) had created provincial parks — no hunting permitted — to protect the animals until a single national park was declared. Last week the Lomami National Park was approved by the President, Joseph Kabila, and then signed into existence by the Prime Minister, Augustin Matata Ponyo. Two weeks before that the Minister of Mines declared the entire park area to be concession-free as well as its periphery for a radius of 50km. 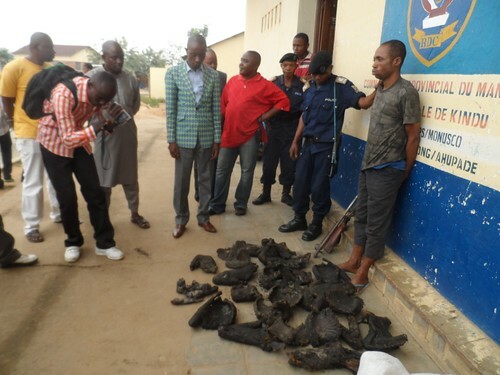 The Minister of the Environment in Maniema, Patrick Lupia, publicly upbraids a hunter who was caught with the four bonobo that he shot. But why make a National Park? Explorations started in 2007. The Lukuru Foundation’s TL2 project found Congo’s great ape, the bonobo, farther southeast than they were known to exist; Congo’s rainforest giraffe, the okapi, was also found on the west bank of the Lomami. Congo peacock were throughout the area and a new species of monkey was discovered, the Lesula (Cercopithecus lomamiensis). Lesula, the recently discovered ground monkey, is intrigued by the smell of the camera trap. Recently the field teams uncovered on the right bank of the Lomami several populations of the dryad monkey, locally called Inoko (Cercopithecus dryas), that was previously known only from a single small area 400 kilometers further west. The TL2/Lukuru project has been able to determine presence and abundance of many animals using camera traps, here set up in a grid in an area near the Lomami in Tshopo province. The Lomami National Park has more of the large charismatic animals that are found only in Congo, than any other protected area in the country. Only the legs, tail and trunk of adult elephants are seen close to the camera trap, but a young one is seen at head level. The Lomami is also the critical central Congolese refuge for the threatened African Forest Elephant. Even before the national park was created the battle to protect these forest giants was constant. The TL2/Lukuru project sponsored the first park guard training with ICCN for the Lomami National Park, December 2015-February 2016. 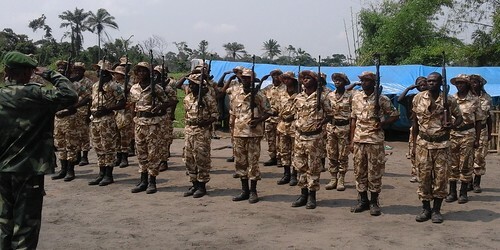 Without adequate park guards, the TL2 teams worked with military, often to control criminal militias who worked with other corrupt military. 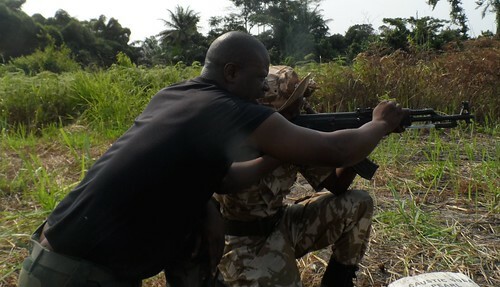 During park guard training the military trained for the proper, accurate and safe use of military rifles. Now: with the National Park decree signed the bulwarks for protection will strengthen. German aid to the parks (KfW) has said it will further increase the park guard force, equip the guards and build guard posts. Their help will be another important collaboration. Currently the TL2/Lukuru teams often carry out surveillance missions without adequate armed accompaniment (here crossing the Tutu River). 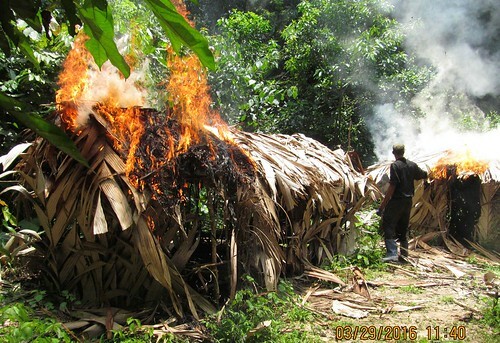 Poachers camps are burned in the park. 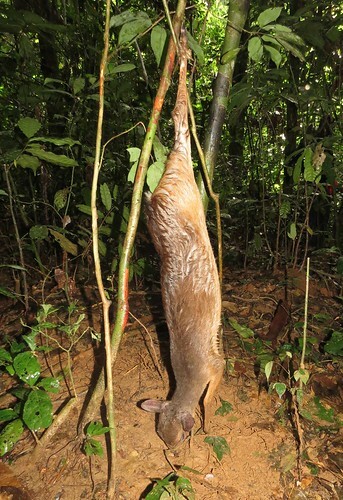 And snare lines are dismantled; unfortunately, not always before they have caught animals. 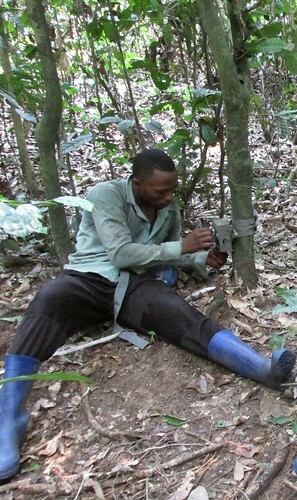 Now: TL2/Lukuru teams continue unabated their work inside the National Park – monitoring of bonobos and elephant, camera trap surveys, and surveillance. 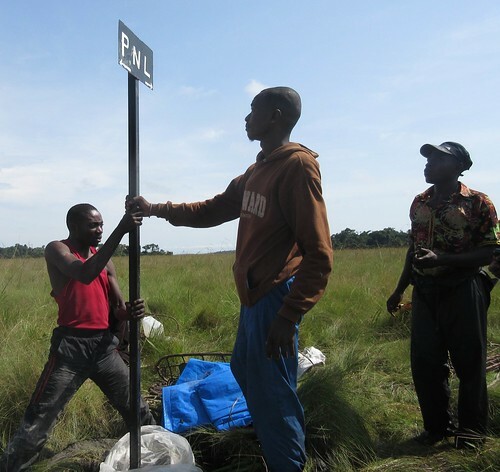 Villagers are working with the TL2 teams in three initial locations around the park to put in fish ponds. Close to 50 hunters have started building individual ponds as well. 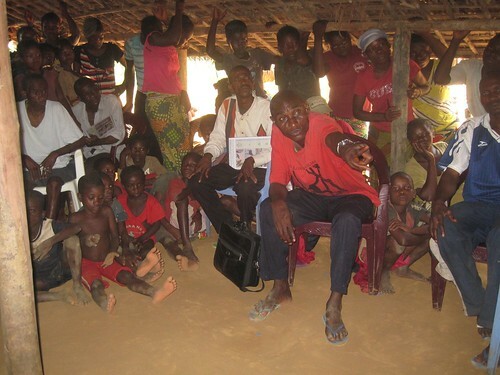 But TL2/Lukuru must continue to increase outreach in the buffer zone. Activities like fishponds and small projects requested by the communities must expand. 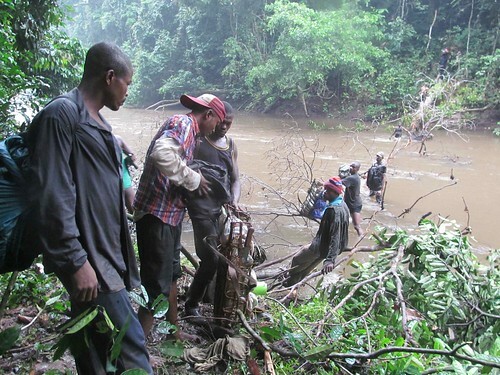 The outreach team supplied food and some materials,and the villagers provided labor to fix bridges along the motorcycle path around the south end of the Park. 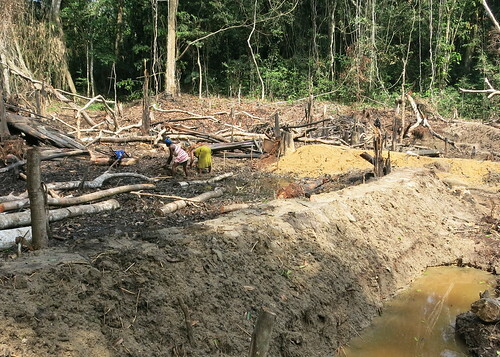 Collaboration with the communities must be strengthened to build the ramparts around the national park: community hunting reserves, community based forest protection. Most forests around the Lomami National Park are still rich in animals. Villagers want to be able to manage these to allow successful hunting for the long-term. Possible, but no small challenge. All the activities that led up to this park and are now building it towards its potential — were supported by some dedicated funders who not only support the work on the ground, but have often provided guidance at critical times. Many thanks to : Arcus Foundation, US Fish and Wildlife Service, Wildcat Foundation, FCF (an anonymous funder), Rainforest Trust, Abraham Foundation, Elephant Crisis Fund, Woodtiger Fund…and others. Some key individuals have been particularly responsive at tight moments: Nancy Abraham, Edith McBean and others. This entry was written by Terese Hart, posted on 2016-07-13 at 9:11 pm, filed under community conservation, Elephant, History of TL2, Indigenous peoples, Law and Order. Bookmark the permalink. Follow any comments here with the RSS feed for this post. Trackbacks are closed, but you can post a comment. Congratulations to you and John and everyone who has worked so long and hard for this day and congratulations to the D.R. Congo! The work doesn’t end, but what an accomplishment! Great work. Also, sounds like a well-designed park. How long do you think it will be before some form of housing will be ready for visitors? Congratulations. You’ve done something wonderful and we thank you. Loved looking at the videos from the camera traps, brought back wonderful memories. Congratulations and thank you for your hard work. This is wonderful news! Great news, and wonderful write up Terese! A most inspiring post! Excellent. With all the sad news of poaching coming out of Africa its wonderful to see this. Well done all involved and good luck. Good job ! Well done! Congratulations! Excellent news. What fabulous news! Many many congratulations to the whole team! Congratulations! I am so happy to read this news. Incredible. It is truly inspiring to see all of your hard work and dedication pay off. A community of fauna that could have been quietly decimated is now protected, while striving to create sustainable resources for local people . I hope TL2 can serve as a model for other regions to be protected, and hope that others will put the same amount of passion and dedication into protecting these forests as you, John, and your teams have done for so many years. I am honored to have the opportunity to work in and experience the Lomami National Park! Official creation of the Park is wonderful news. I hope that the comment about villages on the south edge wanting to sustainably hunt in their own areas comes true, local endorsement and local enforcement is crucial. Terese you and John are phenomenal!